I asked Christopher if he felt comfortable squeezing in between the cows because I remember as a kid getting kicked down, then falling and getting stepped on until I was black and blue. But Christopher, without hesitating, said, "Not at all. 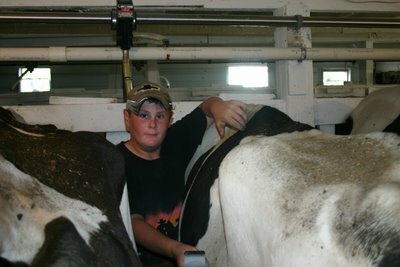 We have the cows trained to milk on either side, and if heifers don't settle down, Dad sends the them off to market." obviously,Tom,he is more skillful than you are.